Morse Code / Watch me on the Reverse Beacon Network! Morse Code / Old Footage, QRP Camping in Florida. General Discussion / Video on bands and ranges. General Discussion / Major Sheldon’s Last Watt. Hello. Here is a short story sent to me by Wayne (N6KR) at Elecraft. The author is W. A Taylor. Click on the attachment below to get the PDF file. Technical Corner / The Resurrection of the Small Wonder Labs SW+ Radio. Military Radios / Czech Military RF-10 Radio. Morse Code / First Time Using a Vibroplex Bug. Military Radios / Pedestrian Mobile Radio With The PRC-320. Technical Corner / The Weber Soda Pop Morse Code Radio, Boxing Up & Contacts. General Discussion / Have you tried the 160m band? General Discussion / New Shirt & Mug. Antennas / The Marvelous 10/20/40 Half-Wave End-Fed Antenna. Antennas / Th Fabulous Moxon Antenna. I really wanted to make one video, but had nothing for this week so there will be a part 2. Antennas / New Elecraft AX1 Antenna. 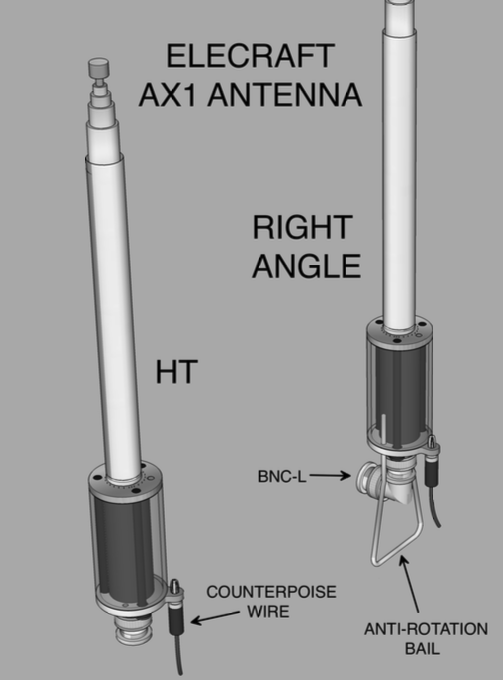 I received a PDf from Wayne about the new Elecraft AX1 antenna, a dual-band 17/20m telescopic antenna. The whip collapses to 6". A tuner is required. It seems this antenna is mainly for HT type operations but also works for tabletop operating. I would put it in competition with the MFJ-1820T.